I prefer this SPAM over spam comments. I’ve been getting lots of comments on my blogs lately. Normally that would be a good thing. However, many of the comments I’m seeing come through are actually spam. Some are obviously spam. Some are a bit tricky. While the Akismet plugin for WordPress works well to filter out the obvious spam comments, some still come through. In the other blog I write, I’ve been receiving up to 10 spam comments a day that have something do to with writing essays and thesis statements. It’s an addiction blog. If anything, those spam comments belong on this blog, which actually talks about writing. And though I do monitor all comments on that blog, due to its content, it’s still frustrating and time consuming. I recently came across a video tutorial from from Michelle Shaeffer that walks you through two ways to combat spam comments on your WordPress blog. The first is to add words to your Comment Blacklist (like “essay,” for example) in your Discussion Settings. The second suggestion from Michelle is installing the Growmap Anti Spambot Plugin (search “GASP”), which forces commenters to prove they are human by checking a box. Automated spambots won’t be able to get a comment through. Michelle explains both in the video. My problem seems to be people spamming me and not bots. For now, I’ve switched my discussions settings to “Comment author must have a previously approved comment.” Hopefully this new setting will allow my regular commenters to post with ease, while giving me the ability to moderate new commenters. I’m also trying out the GASP plugin on the other blog. We shall see. Have you had a problem with spam commenters? What tactics have you used to combat comment spam? Oh my goodness – I literally get over 100 spam comments a day, but I have my comments set to be approved before posted so they don’t get through. I do try to go through my spam folder since occasionally the legit comment gets in there. But Akismet seems to be doing a terrific job of filtering for me. Akismet gets a lot of the spam. It’s these new comments I’ve been getting that seem legit that are driving me nuts. I guess we could take it as a compliment that people want to spam us? Still annoying! I took someone’s advice and closed comments on older posts (which was where I was getting much of the spam) – I think I went with 2 or 3 months as my cutoff. 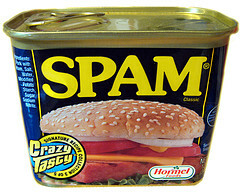 Spam has gone way down in the last few days! Interesting advice. Hadn’t thought of that. Thanks for sharing! It’s definitely tougher to filter out the spam when it’s people submitting nonsense to get a link to their sites. I hope the blacklist tip helps with that. I also moderate the first comment from a visitor and that’s been working well for me. My pleasure, Michelle. I appreciate all your great advice! The blacklist tip has definitely helped my other blog. The initial moderation of comments has worked well here. I keep getting some tricky comments that seem somewhat legit, until I see what they are linking to. There are some good spammers out there!